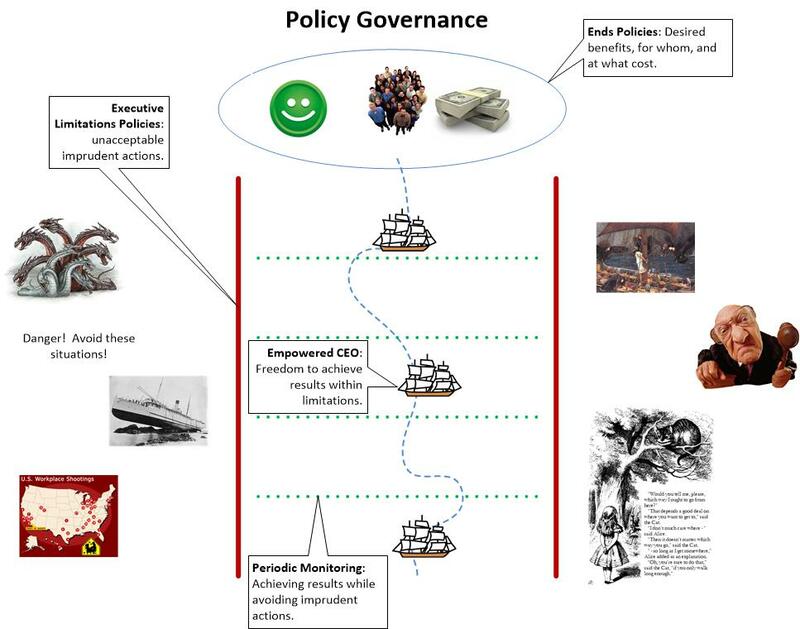 Non profit board policy governance is often difficult to explain. Following is a short description and diagram. Boards first establish ends policies for the organization. These policies specify the benefits the organization should deliver, who should receive the benefits, and what should it cost to deliver the benefits. The board then establishes executive limitations. These are the conditions the CEO should avoid. Limitations tell the CEO what not to do. They do not tell the CEO how to do their job. The intent is to assure the organization does not act imprudently. Finally, the board monitors performance. Monitoring should determine whether the ends are being achieved. Monitoring also determines whether the CEO is complying with the limitations policies. The concepts are not complex but putting them into place takes time, thought, and serious board discussion. Following is a simple diagram illustrating these principles. The diagram can be used with attribution.